Culture: Based on Sherpa Culture. Goshaikunda sometimes also spelled as Gosainkunda and Gosain Kunda is very famous trekking route as a religious and adventurous highland. Goshainkunda Lake that lies between the Langtang valley and Helambu regions is amazingly beautiful trekking destination. Goshaikunda (4,381m/ 14,374 ft), the mountain-lake is considered sacred lake in Hinduism as it is mentioned as created by Lord Shiva himself, in many Hindu religious scriptures. Religious tourists from Nepal, India and other countries reach here during the full moon festival of August and September every year. The trekkers can have view of illuminating mountains, eye catching valley along with one of the most beautiful lakes in the world. 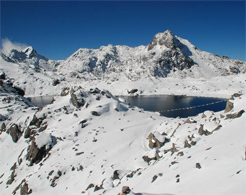 Goshai Kunda Trekking is considered as one of the most popular trekking area of Langtang region.Gosain Kunda is a lake of freshwater oligotrophic in Nepal’s Langtang National Park. The area is rich in its natural as well as its cultural diversity. A spectacular Himalayan view of Langtang, Jugal Himal, and other mountains of Nepal. The large rock in the center of the lake is said to be the remains of a Shiva shrine. People often claim that they see Shiva lying in the water. Day 02: Drive to Syabru Besi from Kathmandu. Day 06: Rest and exploration day in Kyangjing Gumpa. Day 07: Kyangjing Gumpa to Lama Hotel. Day 17: Drive to Kathmandu. * Accommodation on Tea House . * Guide and porter salary ,Accommodation, food,insurance during the trekking .